What happens when you take the Disney formula and apply it to Japanese anime? Why, you get a Studio Ghibli film, what else? Always timeless, always imaginative, the Studio Ghibli films have brought joy to children and parents alike for years now in Japan. Yet, they haven't managed to fully catch on with American audiences until now. Though only having My Neighbor Totoro, Kiki's Delivery Service, Princess Mononoke, and Grave of the Fireflies on the market doesn't really spread awareness, winning an Oscar does! That's just what Hayao Miyazaki's masterpiece Spirited Away did in March. Until the Oscars, only anime fans and movie critics had even heard of the film. The art house gem was instantly given the recognition it deserved and helped usher Japanese anime further into the mainstream (as if it wasn't there already). Yet, this review isn't concerned with what came before, rather it's concerned with what will remain - the two-disc domestic DVD release of Spirited Away. Coming to the market as the first wave of several Studio Ghibli DVD releases, Spirited Away comes loaded with a hefty stack of special features that far exceed the DVD offerings of Kiki's Delivery Service and Castle in the Sky. Upon inserting the DVD, the viewer is greeted with the standard assortment of skippable trailers for upcoming Disney releases (in this case, previews for Kiki and Castle). A very simple, user-friendly menu follows that allows the viewer to jump right into the movie or tweak the film's language and subtitles or even check out some special features. Speaking of languages, having personally seen the movie subtitled and dubbed, I prefer the English dub to the original Japanese version. The care that Disney gives all of its animated films is top notch and they didn't compromise with this film. There isn't a shrill voice or out-of-place character anywhere to be heard. I honestly can't say the same with the Japanese version. For anyone looking for examples of a good dub, throw Spirited Away and Kiki's Delivery Service on those lists. The film itself is a visual journey of one girl from her mundane and lazy existence into something more. 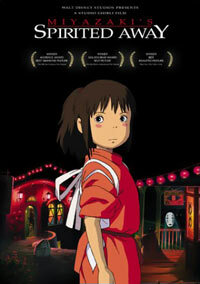 It all starts with Chihiro and her family moving into a new town and getting lost along the way. They come across an old abandoned amusement park and discover a food stand. With no owner in sight, Chihiro's mom and dad chow down on the food, but Chihiro refuses to partake in the seemingly free meal and opts to instead walk around. Upon returning, Chihiro discovers her mom and dad have turned into pigs! With night falling, the spirits begin to come out and Chihiro finds herself disappearing. Luckily, a new friend is there to help her through the jarring experience and help her back on her feet. Being forced into this new reality, Chihiro has little choice but to become a stronger person and mature, or else she won't ever leave or see her parents again. Sporting fun characters and a serious but light-hearted storyline, it's easy to see why this film became the highest grossing film of all time in Japan. It also has a longer shelf life than its metaphorical and less-kid friendly predecessor, Princess Mononoke. Disc One's special features are rather slim, but that's fair, considering the movie takes up the vast majority of the space. What is available is quite interesting, though as it involves the English adaptation of the film. First, we have the introduction that John Lasseter from Pixar gives us at the beginning of the DVD. Directly above this option is a hidden interview with Hayao Miyazaki, parts of which can be found in Lasseter's introduction. The other extra is a short fifteen minute making-of entitled "Art Of Spirited Away" that shows the process that the film was put through in order for the English dub to be created. It plays like a Disney Channel special, but it's a very informative one. Needless to say, disc two is where all the action is. The spotlight extra is a forty-minute Japanese television special that focuses on the break-neck schedule the film went through from pre-production up to its final release. While it is insightful and at times interesting, scenes of the Studio Ghibli crew cooking and eating helps to eat up the program time, and is generally fluff. Also worth noting is how unprofessional Studio Ghibli's sound recording studio looks when compared to other Japanese studios. To not have the actors separated from the sound crew and production staff had to make for some added background noise being picked up. Continuing the English making-of experience is "Behind the Microphone" which offers a glimpse into some of the voice actor's performances. Any Disney fan will surely recognize some of these familiar voices. Another nice extra here is a storyboard comparison for the opening segment of the movie. The viewer can watch the storyboards on one angle and flip over to the finished film while watching it in either English or Japanese. It's shorter than Kiki's storyboard extra (which lasts the entire movie), but is an interesting glimpse into the production process to say the least. Last, but not least, is a series of trailers that cover the entire marketing plan for Spirited Away, through its theatrical and television ad campaign. Running close to thirty minutes, I literally lost count of how many trailers where actually presented here. Suffice to say, this section could have been presented differently as the average viewer wouldn't sit through a seemingly endless supply of trailers. Also worth noting is that the second trailer spoils the entire first half of the movie by giving an abridged version of the events leading up to Chihiro being given her new name. While Spirited Away might not be Miyazaki's most well-rounded film, it is one that any DVD collection shouldn't be without. Best of all, that pesky red tint that plagued the Japanese release is nowhere to be found. Buy it, watch it, love it.